If you’re a parent, you’re probably tired of picking up toys. You’re probably also tired of seeing how quickly your child gets bored with their toys. When a toy is new, they’re fascinated for about 5 minutes, and suddenly, it’s old. What’s up with that? Maybe you’re even suspicious of buying toys at all because you just figure they’ll be one more thing to clutter up your space. The fact is, children benefit from free play (including with toys), but some toys bring more learning benefits than others. Here are a few suggestions for educational toys for preschoolers. Maybe you’ll want to put one or more of these onto your wish list for your child’s next birthday. Sets of counting bears are beloved in classrooms everywhere because of the number of ways that you can use them for developing a child’s math skills. Counting bears come in several different colors, so they can be used for patterns and sorting in addition to counting. Plus, since your child will probably encounter these bears at preschool, they’ll know what to do with them and will have even more fun with them at home. Pattern blocks are blocks that come in geometric shapes that are cut to precise sizes so that their edges are the same length. Your child can rearrange them to create an endless variety of pleasing patterns, and they’ll also begin to get familiar with their shapes. One of the great things about most pattern block sets is that they paint each shape one consistent color (for instance, all the triangles might be green). This provides an extra measure of reinforcement to help your child learn the names of all the shapes. Star builders are chunky blocks that look sort of like a 6-sided asterisk (*). With their larger size and interlocking ability, they are easy for little hands to manipulate. 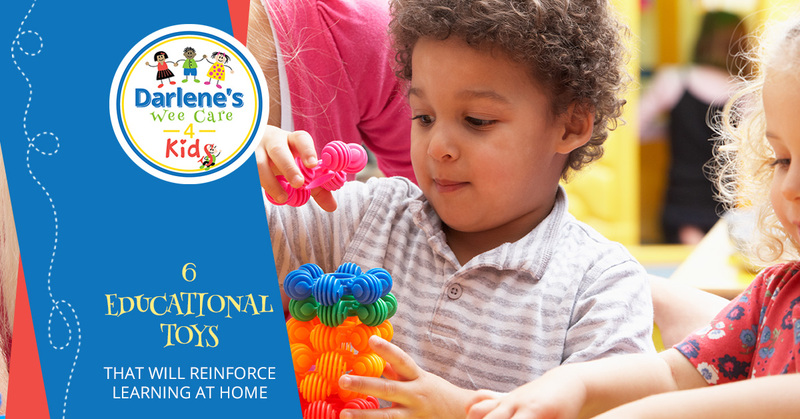 Your preschool child will be able to link them together to create shapes, chains, and towers, developing their motor skills and their spatial awareness. Finger puppets (or even full-size puppets) are wonderful toys to boost your child’s imagination. Get your child started with what to do by acting out a mini-drama with finger puppets on your own hands, and let them interact and take the story wherever their imagination leads. Prepare to be amused (and amazed!) at the off-the-wall story plots your preschool child can come up with. Linking cubes are little interlocking cubes of different colors that you can use to teach math concepts to young children. When you hear “math,” though, don’t mistake these linking cubes for “boring.” These simple cubes can engage your child’s attention for hours, and in the process, they’ll be learning skills from counting to constructing 3D shapes to developing an awareness of patterns. Dominoes are another great toy for kids, and this is especially true if you get a well-made set that’s made slightly larger (to reduce the risk of choking in case they get put in mouths). Or, try the game of Quirkle for a fun alternative to dominoes that the whole family will enjoy. When you enroll your child in our day care in Upper Darby, you know that your child will be instructed, nurtured, and cared for. Start the enrollment process by contacting us today!